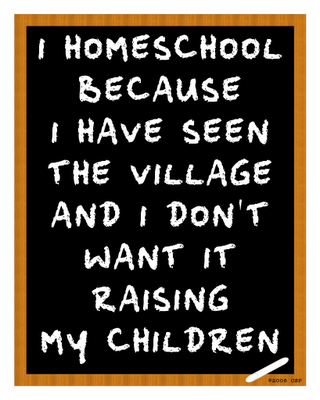 My friend, Sue Ryan at Corn and Oil has been writing about what has been going on in Illinois this month, and combined with what we have been discussing here in Indiana and in Michigan, it almost appears like an all out frontal attack on homeschooling. Parents who didn’t fill out an attendance record are educationally neglecting their children! Parents are skipping school and ‘saying’ they’re homeschooling! Conspiracy? Nah. But while I won’t give it that much credit, I do believe that what is going on of late is a result of the practice I’ve called, “Public School Excommunications, or Ex-schooling.” Public schools, in the desperate need to reduce the dropout rates among students (including those who are not old enough to legally drop out) have found that by encouraging parents to simply “say” they are homeschooling, both the school and the parents can conveniently get rid of a mutual problem. We can all blame NCLB all we want, but the fact is, no matter what was required of public schools to meet the federal demands, teachers and school officials all across the country did everything they could, to either dumb down the requirements so more kids could ‘appear’ to pass, or they sabotaged their classes to prove the point that the Republican’s plan for school reform wouldn’t work. Part of the sabotage plan (I would argue) was to indict parents for not holding up to their end of the bargain to educate their children after (school) hours. Stupid kids aren’t the schools fault… it’s the fault of parents who don’t appreciate education the way they should. The battle of who’s schooling whom stays on cruise control until those stupid public schoolers get too hard to handle and control; then it’s time to get rid of the problem. It’s like a getting out of school free card! The solution is obvious! The school gets rid of a child that doesn’t want to be there and is likely acting out in disruptive or violent manners (not to mention purposely tanking his or her state mandated tests) by forcing the parent to leave the school in the only legal way possible — they are forced to transfer out of public school to a private school. And since they can’t afford a private school, they are told their only choice is to homeschool. It’s likely the parent is already frustrated with her child’s behaviors, and double-frustrated with how the school handles and miseducates her child. What concerned (or even neglectful) parent wouldn’t be glad to get out of the cycle of abuse and punishment inflicted by government schooling on her child? Did you recently decide to homeschool, or have you been doing it for a long time? Why and when did you decide to leave public school to homeschool? Were you told that you were required to homeschool? Were you told that if you didn’t, CPS would be called on you? Were you informed of the legal requirements to homeschool, or do you feel you were just tossed out? Did you look for local and statewide resources for help, once you decided to homeschool? Would you have rather gone to another school, if you had a choice? These are the first questions reporters should be asking when they come across cases like this. But instead, we are going to get more and more articles indicting non-homeschoolers for no other reason than NOT going to a government school. Therefore, this will be the year of The Hunted Homeschooler.